Bill (’76) and Janet (Wilson ’74) Montgomery started their nonprofit, Just Mercy, in 2010 after an earthquake devastated Haiti, killing more than 200,000 people. With 1.5 million people displaced, Bill took his background in construction, mechanics, farming and gardening to the impoverished country. Since then the nonprofit has grown, and with the help of others, the Montgomery family assists a school with more than 350 children, teaching academics as well as Christian character. In 2012, they moved to Ile a Vache, an island off the coast of Haiti, where they have a woodshop in which Haitian men craft handmade spoons. The spoons, made of Cuban Mahogany, are available for a $20 donation, which helps the men provide for their families in a country with a staggering unemployment rate. Since the beginning, God has provided in ways the couple never thought possible. At times they questioned how their non-profit would continue, Janet said, but various donors always came forward at critical moments. Because of natural disasters such as a more recent hurricane, Janet said money is again drying up on the island, and its citizens are struggling. Last year, the Montgomery’s bought land and created a garden for the people on the island of Ile Viche, while also planting hundreds of fruit trees to give food for years to come. 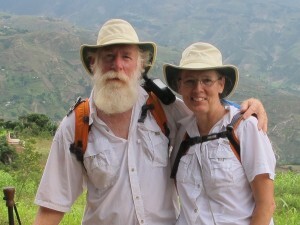 In addition to Just Mercy, Bill and Janet have started Adventure Mission, a program leading short-term mission trips into Haiti to work alongside Just Mercy. When people go on mission trips, they’re often more changed than the people they come to serve, Janet said. Bill said although Just Mercy is a small nonprofit, it is large in productivity. View more from Lauren Franco. We have known Bill and Janet since the early 70’s. They are the salt of the earth and we see such fruit coming from their labor of love in Haiti. If you are looking for a ministry to support, these are your people! Thank you, Peggy!! We do appreciate it! !